Some of the most popular trademarks of elegance are defined by pearl and diamond earrings. Any woman’s femininity and grace would be instantly highlighted by a pair of refined pearl and diamond earrings. Just like the little black dress, these jewels will never go out of style, standing the test of fashion trends and the test of time since pearls can last forever. A touch of glamour and subtle luxury hasn’t hurt anybody. 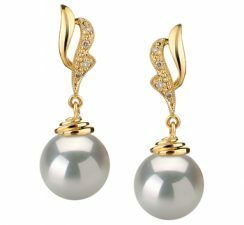 These subtle pearl earrings are highlighted by nine little diamond stones that go well with any gown you can think of. Pearl earrings also flatter any woman’s long fine neck and necklace, so you can also choose the necklace that goes with this radiant pair of cultured pearl and diamond earrings. Check out the pair of earrings here. The butterflies are covered in little diamonds creating a splendid, unforgettable contrast with the black cultured pearls. These pearl and diamond earrings are bound to make any night memorable, whether you’re attending a very special event or anniversary; these pearl and diamond earrings are suites for any formal context you can think of. Have a better look at these superb black pearl and diamond earrings here. If you have always been in love with the sea, why not wear something that will always remind you of the calming scenery and the sound of waves hitting the cliffs? The diamond accents and shell shaped tops can draw attention to your beautiful facial features. The greatest thing about these dazzling pearl and diamond earrings is their color. The color is so versatile that it works with every color contrast and glamorous outfit that you can think of. To notice the incredible details of these pearl earrings, click here. Some combinations may be daring, but the edgy glow that these pearl and diamond earrings have proves that diamonds can go well with mostly any stunning accessory. The swirly design, the golden accents and the subtle sparks that the diamonds have can leave anyone breathless. These drop pearl and diamond earrings have that distinct timeless design that every woman dreams of; it’s alluring, it’s graceful and it seems to copy a woman’s beautiful and mysterious allure effortlessly. Have a better look at this amazing pair of earrings here. If you want to get a glimpse of something exotic and incredibly beautiful, why not wear a pair of black Tahitian pearl and diamond earrings? The smooth surface of these perfect rounded pearls shows that nature can create the most astonishing, close-to-perfection things that our imagination could possibly grasp. The glittering shine of the subtle diamonds draw attention to the black pearls that contrast with the wild gold. These earrings can adorn any outfit, making it stand out in the crowd without any effort. These pearl earrings can be worn for day events as well as night ones. The playfulness that pink pearls exude can never go unnoticed. Pink pearl and diamond earrings are a rara avis in the accessory department so if you aren’t a big fan of conventional looks, go for a daring piece of jewelry that people don’t get the chance to see very often. The shimmering diamond details and the pink glow of the pearls create an amazing image of a lady that is dressed to kill. Be drop dead gorgeous in a flawless gown while wearing some of the world’s most elegant pearl and diamond earrings. A pearl needs to shine in the right context, helped by an inspired design. The swirly details help any person focus on the pearl and diamond earrings. These Tamara white gold cultured pearl earrings have an ethereal quality to them. If you love wearing surreal dresses, chances are that you will definitely find these earrings the perfect match to a flawless outfit. Shine from head to toes by wearing a pair of exquisite pearl and diamond earrings. Be that woman who turns heads and makes other women wonder where she got those stunning earrings from. Who hasn’t been fascinated with unusual, beautiful things? Lavender pearl earrings aren’t a common sight these days, so if you plan on leaving everybody speechless, consider a pair of uniquely colored pearl and diamond earrings that will help you have all eyes on you. The shimmering quality of the diamonds will make people have a closer look at what you are wearing, both outfit and accessory wise. These lavender pearl earrings are any woman’s dream come true. They have a unique color and they will never be out of style. These pearl earrings are surrounded by diamonds. If you love that popular “diamonds are a girl’s best friend” quote, this pair of pearl and diamond earrings uses plenty of diamonds to begin with. Their subtle shape makes it easier for you to wear a gown in style. The glamorous vibe these pearl earrings sends out reminds people of the Golden Age of Hollywood, where celebrities wore diamond studded jewels to highlight that glamorous side of fame; and it seems that diamonds and pearls have never been more glorious, graceful and filled with astounding designs. There is a romantic side in each and every woman. This romantic side is dying to get out at times so why not get in touch with your feminine, mysterious side and wear a pair of pearl and diamond earrings that has a fabulous heart shaped design? The white freshwater pearl is surrounded by a heart shaped Sterling Silver design that draws attention to the perfect pearls used for these gorgeous earrings. The subtle spark of the diamonds completes a fine piece of jewelry that looks more like a work of art than simple jewels.